Posted in Biking, Outdoor Activities, What to Do? You can bike on the road to the Mirador for a great cardio workout that ends at a fantastic view down the coast. 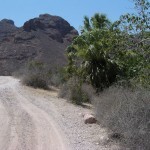 If you follow the paved road to the end, it meets a dirt road that will take you to La Manga and into the desert (map). You can put together dozens of kilometers of singletrack, doubletrack and ranch roads. 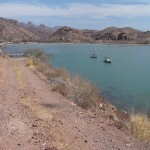 If you’re feeling really energetic, try the 1500-foot “Microonda” outside Guaymas … it starts behind the jail and rises steeply for a great view of Guaymas. 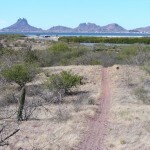 A Guaymas mountain bike association has built a challenging 11 km single-track loop trail through the desert. This rugged trail is not for the faint at heart. The views over the estuary are beautiful. More about Estuary bike ride. Uphill pedal through the desert to Nacapuli Canyon and relaxing ride home with view of water in the distance. There’s also a 9km loop on the way to Nacapuli. 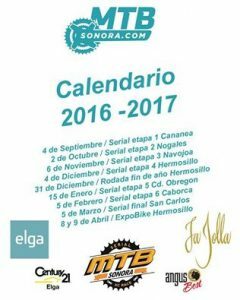 This is the trail used for the 12 Horas Salvando Vidas bike race. A short but enjoyable ride to a quiet cove. You can bring your snorkel gear. Sign-up for the free weekly newsletter for up-to-date info on events and what’s happening in San Carlos.